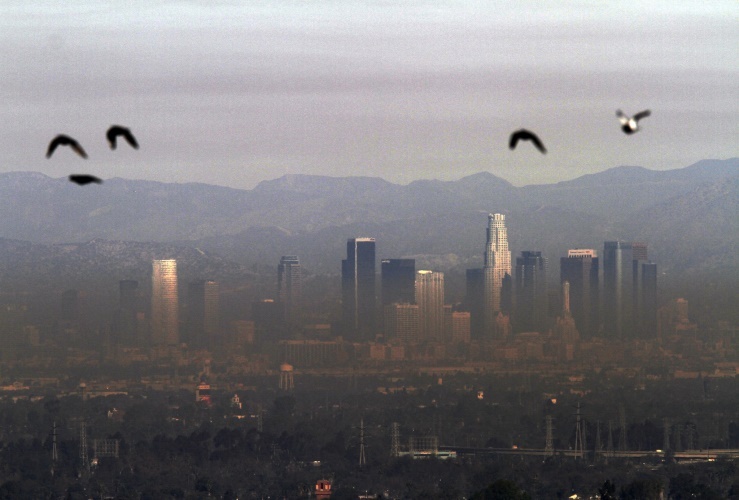 Sources of air pollution in California include: gasoline and diesel-powered motor vehicles, factories, power plants, fireplaces, refineries, gasoline storage and dispensing facilities, businesses that use solvents and paint, household and commercial consumer products such as hairsprays, automotive cleaning products, and aerosol paints that contain smog-forming ingredients such as hydrocarbon propellants and alcohol. Walk or ride a bike when possible, take public transportation or carpool. Organize and condense errands into one trip, telecommute if possible, drive less, particularly on days with unhealthy air. Support the Smog Check Program. When in the market for a new car, look for the most efficient lowest-polluting vehicle or even a zero-emission electric car. Turn the lights off when you leave a room, harness the power of the sun, open the blinds and turn off the lights. Replace energy-hungry incandescent lights with compact florescent light bulbs. Recycle paper, plastic, metals, and organic materials. Use an EPA-approved wood burning stove or fireplace insert, don’t use your wood stove or fireplace on day with unhealthy air. When ready to replace, look for energy star appliances. Eat locally, shop at farmers markets and buy organic products. Store all solvents in airtight containers. Use an electric or push lawn mower. Use water-based cleaning products that are labeled “zero VOC’. Print and photocopy on both side of paper. Turn off office equipment, computers, printers, and fax machines, after hours. This article originally appeared on the LLUH Environmental Health & Safety's Speaking of Safety Blog in December 2016. Environmental Health & Safety is a division of Risk Management.